Biographical Information: "Paddy" as he was known, was born on 21 May 1915 in Spilsby, Lincolnshire to William and Edith Hulme. The family later lived in Almondbury, Huddersfield, West Yorkshire. He attended King James School in Almondbury, Huddersfield. He later attended St. John’s College, York (for teacher training). Paddy worked as a teacher at Stile Common School in Newsome, Huddersfield before joining the Navy. 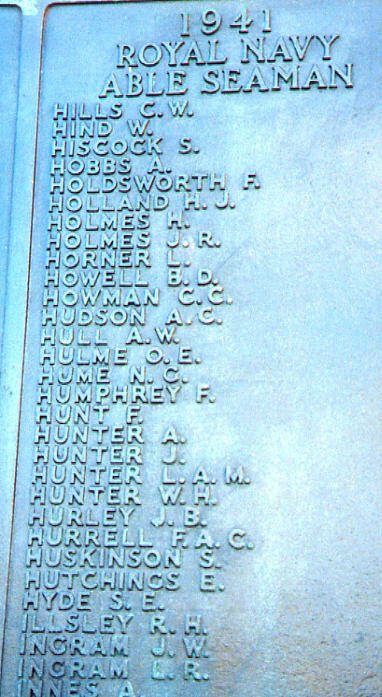 He is known to have lived in Number 32 mess whilst aboard Hood. He served as an aircraft spotter for a time but later on one of the anti-aircraft teams as an AA3. He was 25 years old at the time of his loss. We have no additional information.